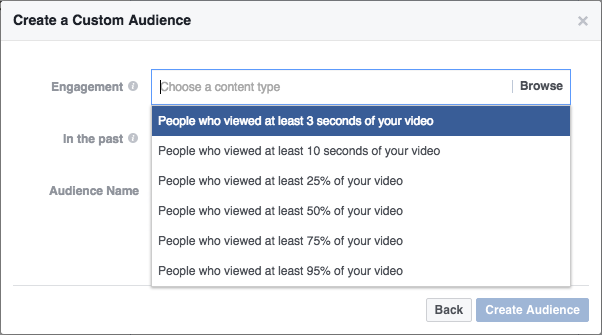 Facebook recently released another enhancement to Custom Audience targeting, Engagement Custom Audiences. The Facebook Engagement Custom Audiences offers a new way to refine your audience targeting and reach the people who show an interest in your brand. The main difference between Engagement Custom Audiences and Website Custom Audiences is where data is gathered. PPC marketers can now target audience segments based on their interactions with your Facebook content. People who take actions on your Facebook ads like viewing your videos, clicking your lead form, or clicking your Canvas ad are signaling how they want to engage with your brand. In this post, we'll cover how to get started Facebook's Engagement Custom Audiences and share our favorite tips to audience segmentation based on content activity and campaign objective. You can manage and create all your audiences from the Audiences page within Facebook Ad Manager. 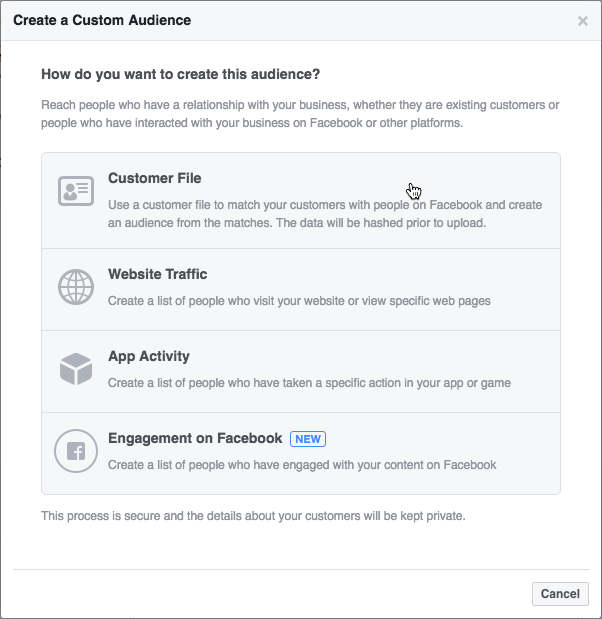 Select ‘Create a Custom Audience’, from there you’ll see a new window pop-up with the new Engagement on Facebook audience option. Pretty simple, but now what? In the next section, we’ll cover the best ways to use an Engagement Custom Audience for both direct response and branding objectives. As a refresher, Facebook Leads Ads allow you collect lead information from people who click or tap on your ad. The ad will open a customizable lead form where users can complete and submit, or simply view the form without submitting their information and drop off in the conversion funnel. 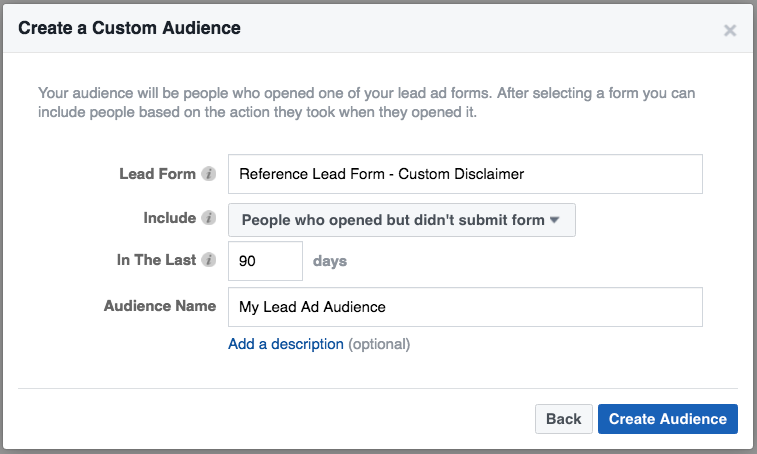 With Engagement Custom Audiences, you can retarget ads to people who opened your lead form but didn’t complete it. This could remind users of your brand, and help drive a conversion later on. Alternatively, if you have a longer sales cycle such as a B2B company, you can use an Engagement Custom Audience to retarget ads to people who actually completed a lead form. In this scenario, you may want to show them an ad that drives them further down the conversion funnel like product demo or case study. Facebook Canvas Ads create an immersive experience for mobile users on Facebook. This ad type is flexible for any objective, and characterized as “instant ads” because you have complete creative control to achieve any objective you want. Some examples include communicating your brand story, promoting a new movie, or showcasing individual products. Because Canvas Ads are visual in nature, people may get tired of seeing these ads if they’re shown to the same audience too frequently. To avoid saturating your target audience, create an Engagement Custom Audience for the people who opened a Canvas Ad and click on the link, and then exclude these users in your campaign targeting. This way you ensure you don’t overload the same people with the same ads they have already engaged with. Similar to a Facebook Canvas Ad, when thinking about who to exclude from a video ad campaign you may not want to continue showing videos to people who watched a majority of a particular combination of videos, so you can mix and match the previous options with the videos that were viewed. Alternatively, you can apply the same Lead Ad retargeting concept. If a person viewed majority of your video (and you have a longer sales cycle), you can retarget ads to them that cater to different stage of the conversion funnel to drive them towards conversion. It’s a simple setting selection, but extremely powerful and more useful than Email Custom Audiences as they allow you to target people who engaged with a specific video, lead ad, or canvas ad during the past day (or X number of days you set it to). With targeting options like Engagement Custom Audience, creating evergreen ad campaigns are now possible because the ads you retarget to these people will nearly always be relevant based on their recent actions. Apart from retargeting, Engagement Custom Audiences can also be used for audience expansion efforts on Facebook. When creating a Lookalike Audience, you can leverage your Engagement Custom Audience as a seed list, which will show ads to people who are similar to those in your seed list, in demographics, interests, and other profile characteristics.